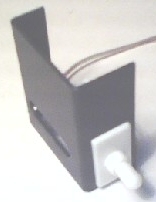 Can be mounted on Vertical or Horizontal Door Supports. Switch Contacts are closed when Plunger is depressed. Several units can be wired in series for redundancy. Bracket is Coated in Black Polyurethane.